Seamless gutters provide a clean finished appearance while ensuring your home is protected from water damage. If you're looking for new gutters for your home, you know how many options are available. Materials such as aluminum, steel, copper, and wood are all choices, along with various brands, styles, and attachments such as gutter guards. Aluminum gutters are the most popular option on the market due to their blend of affordability, style, and durability. LeafGuard by Midlands Home Solutions installs quality seamless aluminum gutters that will give you the look you want for your home and the performance you need. Call us today at 1-844-807-6136 or click below to get started with a free installation estimate in Omaha, Lincoln, Council Bluffs and the nearby areas! Seamless lengths: Seamless gutters are custom cut to the length required, eliminating the need for seams that weaken the gutter and can lead to leaks. Durable, factory-applied finish: Aluminum gutters come with a factory-applied finish that is available in a wide variety of colors to match your home and/or roof. The finish won't wear off or require maintenance unless you have to touch up scratched areas. If you want something truly unique, they're easily painted any color. No rust or corrosion: Aluminum won't rust or corrode, making it truly a no-maintenance material. Speedy installation: Our crews can usually complete a seamless gutter installation on an average house in a single day, as long as the fascia boards along the eaves are in good condition. Affordability: Seamless aluminum gutters cost less than other types of gutters while providing equal performance and a great finished appearance. 1. From flat to formed: This K-profile gutter starts out as a flat sheet of aluminum. The gutter machine forms the profile, enabling the crew to create seamless gutters of any length. After the machine trims the gutter to the required length, workers attach end caps, then crimp and seal the caps to make the gutter watertight. 2. Brackets add strength: These cross braces are installed every 36 inches or so to stiffen the gutter. The brackets also provide attachment points for screwing the gutter to the fascia board during gutter installation. 3. Fastened to the fascia: Driving a screw through each gutter bracket and into the fascia board anchors the gutter in place. Each gutter section is pitched so that water can drain toward the drop outlet for the downspout. 4. Down the drain: Downspouts are assembled from elbows and straight sections, then screwed to the gutter drop outlets and to the wall of the house. If you're interested in installing new gutters for your home, seamless aluminum gutters from LeafGuard by Midlands Home Solutions are the ideal choice. We can inspect your home and recommend the right style of gutter for your needs to ensure you get the right look and function. Call us today at 1-844-807-6136 or contact us online to get started on your gutter installation project. 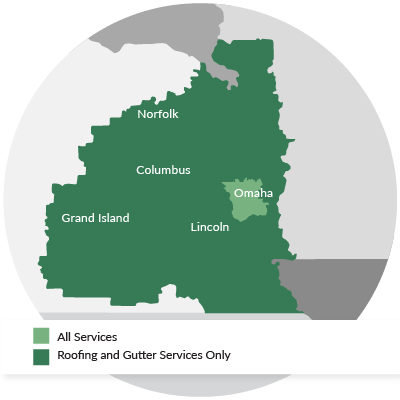 We offer free estimates on all our work in Omaha, Lincoln, Council Bluffs, Bellevue, Sioux City, Kearney, Grand Island, Hastings, La Vista, Fremont and the surrounding areas.